Visibility is a strong suit thanks to relatively thin roof pillars, and increased length results in good adult interior space. Forty years ago, when many American cars still bore designs created under the “bigger is better” ethic that held sway before the first gas crisis rendered it suddenly irrelevant, Honda made headway in the U.S. with cars that espoused a “less is more” philosophy. It’s ironic, then, to see Honda’s latest version of the Civic try to get better by getting bigger. Rest assured, no one will mistake the 2016 Civic for a 1976 Oldsmobile Ninety-Eight Regency. Still, the fully redesigned Honda compact does see dimensional gains throughout its platform. Fortunately, some of them translate into extra room for passengers and cargo, which owners will no doubt like. 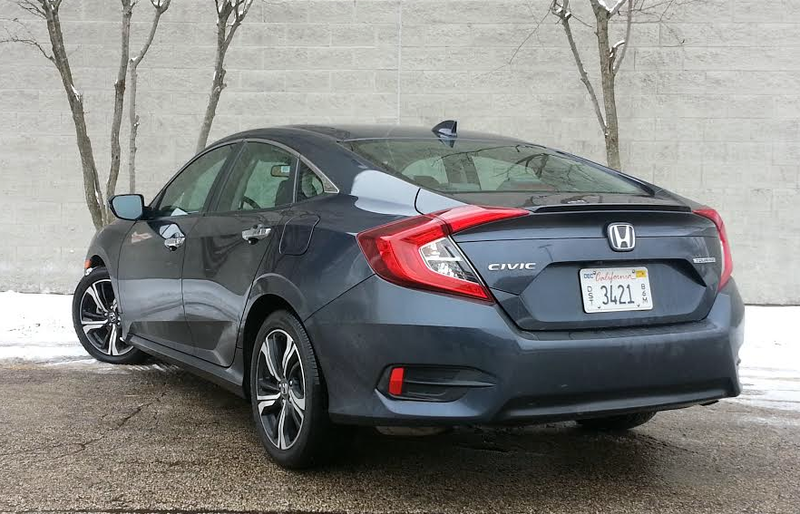 Consumer Guide® had the chance to test the, ahem, Civic leader—the loaded-as-all-get-out Touring four-door sedan. Logging in at a base price of $26,500 (add another $835 for destination), it sits near the high end of the entire crowded compact class. 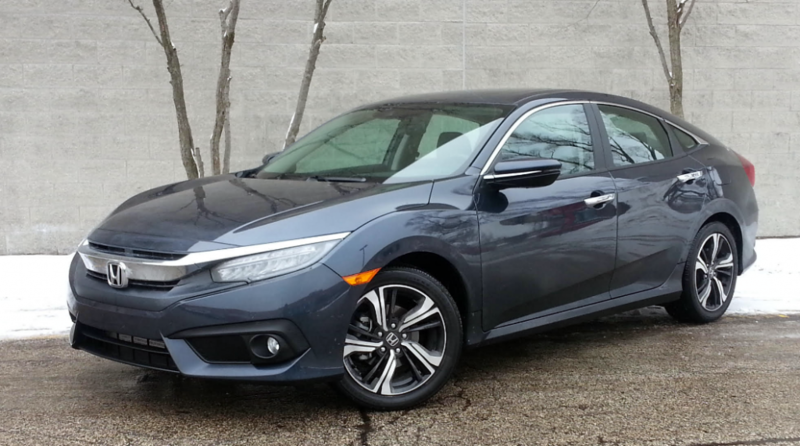 Selecting the Touring buys practically everything Honda has to offer, starting with a power moonroof, fog lights, decklid spoiler, and 17-inch alloy wheels. Comforts and conveniences run to remote starting, a tilt/telescoping steering column, console storage compartment with sliding arm rest, 12-volt power outlet, pushbutton starting, dual-zone automatic climate control, automatic-dimming rearview mirror, leather seat upholstery and leather-wrapped steering wheel and shift knob, and 60/40 folding rear seats with a pull-down arm rest. 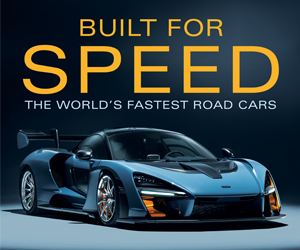 Tech features include a multiangle rearview camera, Bluetooth connectivity, USB port, seven-inch customizable touchscreen, smartphone-enabled HondaLink, Apple CarPlay or Google Android Auto connectivity, satellite radio, and HD radio. On top of that come the items that are standard only in the Touring (though a few can be found in specially configured versions of lower-line Civics). That list counts satellite-linked navigation with voice recognition, the Honda Sensing safety suite, a premium 10-speaker audio system, a power front-passenger seat, heated rear seats, rain-sensing windshield wipers, LED headlights, chrome door handles, and turn signals in the heated power mirrors. HondaLink accesses things like personal music and podcasts, with touch, pinch, or swipe control on the display screen. (It’s easier to do things like change radio stations or alter volume via the steering-wheel thumb buttons than to go through the screen, however.) Honda Sensing is a pack of electronic watchdogs including collision-mitigation braking, road-departure mitigation, forward-collision warning, lane-departure warning, lane-keep assist, and adaptive cruise control. Interior materials match the price, with padded surfaces being found on the dash top and door tops, while soft leather covers the seats. The Touring’s sole powerteam is a new 1.5-liter turbocharged four-cylinder, Civic’s first-ever turbo mill. 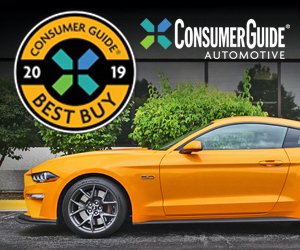 Endowed with direct fuel injection, it is rated at 174 horsepower and 162 lb-ft of torque, and it’s paired with a continuously variable transmission (CVT). Once the turbocharger kicks in—unfortunately not as quickly or smoothly as you might wish—the Civic feels pretty lively. Building up to cruising speed—a process restrained somewhat by the CVT—registers with a bit of a groan, but once there things quiet down. EPA fuel economy estimates for this combination come in at 31 mpg in city driving, 42 mpg on the highway, and 35 combined. After wheeling CG’s Touring test car for 84.8 miles, this driver saw 30.69 mpg—and 67 percent of his stint was in city-style driving. Steering is light and responsive enough for easy maneuverability but genuine sport sedans need not tremble in the Civic’s presence. Rougher pavement shakes up ride composure somewhat. Interior room is one of the car’s strong points. Longer-legged drivers can stretch out, and the moonroof doesn’t exact too great a toll on headroom. The 10th-generation Civic’s redesign added 1.2 inches of rear legroom, and in this driver’s estimation, it’s right up there with the Volkswagen Jetta for small-car rear-seat space. Though the footwork may take some planning, three adults might squeeze across the seat for a short time if the middle passenger isn’t too tall. Visibility is good in just about every direction, enhancing the sense of spaciousness. A nicely executed cabin has an upscale look and feel in most corners. Soft-touch surfaces adorn the dash top and much of the front door panels. Front seats in CG’s sample car were covered in soft gray perforated leather, with darker-gray accent strips down the middle. In back, though, the accent strips were omitted, and the doors were topped with hard grained plastic with no give. Interior storage is a mixed bag. The glove box is fairly large, and the partially open console box is cleverly configured. (For instance, the structure that contains the two front cup holders can be removed to create more space.) Rear passengers get cup holders in the center arm rest. On the other hand, door pockets aren’t particularly big, and there is just a single rear-seat storage pouch affixed to the back of the front passenger seat. The floor of the enlarged trunk is flat throughout, but narrows quite a bit between the wheelhouses. Rear seats fold fairly flat, with a slight gap between them and the trunk floor. Getting bigger has made the Honda Civic better in some ways. However, with a wide price spread—base models start at less than $20,000 including destination—compact-car shoppers don’t have to spend big money to find out how. Civic’s sleek new profile gives it a “hatchback” look, but it retains a conventional sedan trunk. Written by: The Daily Drive staff on February 24, 2016.on December 7, 2016.